Exhibitions, collections, libraries and archives of one of the world's great art museums. Every band from Au Funkster to Bret Zvacek, and thousands of other bands and artists I've never heard of. "The Artists Bluebook," this site maintains a database on 26,000 American artists spanning the 16th to the 21st centuries. Information includes dates, states, methods, biographies, subjects for which they're best known, a decade-by-decade breakdown of 20th century literature in which they are referenced, and total number of auction lots sold and unsold of their works. "The King of Swing's" life story, along with RealAudio music files for your listening pleasure. Links to related Big Band era sites, too. Royalty-free stock photography at prices starting at one dollar. An excellent source of professional, high-quality images for use in advertising, presentations, and brochures. Several purchasing options are available ranging from a guest purchase ($2 for a small photo) to the ability to download 25 images a day for $1200 per year. Free membership is not required, though discounts apply to members. You can also sell your photos. Visit the site for complete information. Search this online library of thousands of free books by authors such as Dickens, Austen, Shakespeare, Mr. Mo., and many others. More than 34,000, full-length, classical music files in MIDI format from more than 1,800 composers. An integrated search engine makes for fugue-finding with finesse. $25/year to access this aural treasure-trove. The full texts of everything from Aesop to Voltaire. Nothing from Mr. Modem...yet. Everything you could possibly want to know about the Dance lifestyle, culture, and entertainment. Includes all dance styles from the Argentine Tango, to Flamenco, Folk Dancing, Hip Hop, Line Dancing, and the event for which Mr. Modem won a bronze metal at the 1984 Summer Olympics, Clogging. The official Duke Ellington Web site; contains biographical information and rare photos. This vast image library permits visitors to search more than 18 million images, including royalty-free clip art pictures, illustrations, stock video clips, maps, and more. A chronicle of popular music that has been censored, banned, suppressed, or altered against the wishes of its creators and intended audience. For example, did you know that the Benton Harbor, Michigan marching band was forbidden to perform “Louie Louie” during the annual Grand Floral Parade? I’m still reeling over the news. Founded in 1900, the Houston MFA is the largest art museum in America -- well, south of Chicago, west of Washington, D.C., east of Los Angeles, and north of Tijuana. Stop in and see fabulous works of art and exhibitions from world cultures from antiquity to the present. Created in 1991, Jazz Online was the world's first commercial interactive network devoted to jazz. All styles of jazz are covered. Jazz Online's mission statement has remained the same since the beginning, "Everybody needs a little jazz in their life and Jazz Online is the place to find it!" Current and archived exhibition information, photographs, lectures, and links to related topics. These are your tax dollars at work, so please stop in and enjoy your artwork. While not exhaustive, this site certainly provides more than enough information to give any reasonable person a headache. Included are many of the best literary links on the web and connections to other major online literary lists. Enjoy the priceless exhibits, take a virtual tour of The Louvre, or plan an off-line visit to this historic museum. This site is designed to provide an overview of the collections on display in the Museum's galleries. Also available are a floor plan, a calendar, which offers a detailed current listing of special exhibitions, concerts & lectures, films, and other museum activities. "Art too bad to be ignored" is the featured attraction at this museum. The Museum of Bad Art is a private institution dedicated to the collection, preservation, exhibition and celebration of bad art in all its forms and in all its glory. Collections, exhibitions, programs and event schedules. A collection of some of the most important literary works of Classical and Medieval civilization. All texts are fully searchable. The Sounds of the 20s, 30s and 40s all digitally re-mastered and available on CD-ROM. Lots of sound samples and photos in the Photo Archive section. A user-friendly library of poetry that spans thousands of works by hundreds of authors. You will find many works here, by both obscure and familiar poets. Works range from medieval ballads in middle English to traditional ballads, popular lyrics of centuries past, interpretations of American Indian chants, though I haven’t found works with any “doo-dahs,” much to my chagrin. Poems range from single stanzas to entire books, with a large selection of sonnets, narrative poems, and topical works to choose from. The site itself is named for the corner of Westminster Abbey which serves as both resting place and memorial for many of England's great poets, though the works in the collection span the English-speaking world and include some translated works, as well. With a permanent collection displaying impressive roll artifacts and a wide-ranging roster of on-going and temporary exhibits, the Rock and Roll Hall of Fame is dedicated to exploring the past, present and future of music and the cultural from which it emerges. In addition to its own collection, thousands of items are on loan from artists and collectors from around the world. In addition to these items, the Museum's exhibits utilize film, video, interactive kiosks and, not surprisingly, music. Searchable; includes a discussion forum, a chronological and alphabetical listing of his works, quotations and a glossary. "For soothe, upon what site dost thou lurketh? Fetch hither, sweet modem." Ah, they just don't write 'em like that anymore. Here you'll find everything from "All's Well That Ends Well" to "Winters Tale." So whether it's comedy, history, tragedy or poetry, you'll find the Bard's best at this site. Devoted to preserving vintage music from the early decades of the 20th century, this site represents one man's effort to share his personal collection of 78 rpm records with a new generation. More than 125 jazz, dance band, swing and vocal recordings from the Roaring 20s through the Great Depression; 60 recordings from the pre-microphone days of 1900 through 1925, have all been converted to RealAudio format, perfect for playing through your computer's speakers. A comprehensive directory of online museums and museum-related resources. A Frank Gehry-designed museum, the Weisman resides at the University of Minnesota. The Weisman’s permanent collection includes more than 17,000 works of art and is especially rich in the areas of American modernism, ceramics, Mimbres pottery, and Korean furniture. An interactive gateway to all exemplars of qualitative arts information and culture on the Internet. Artists, museums, galleries, art history, arts education, antiques, performing arts ranging from dance to opera, classified ads, resume postings, arts chat, and discussion forums. 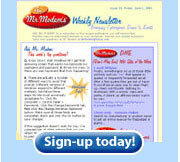 An online community for writers and readers of all interests and skill levels. Whether you're an enthusiastic, creative writer looking for the perfect online location to showcase your writing, or a casual reader searching for a good story, this is the Web site for you. Writing.com currently has more than 350,000 members and almost a million literary items accessible online, so you’ve got a lot of catching up to do.